The stable has a busy couple of days at Warrnambool coming up kicking off with two runners in the opening event on Wednesday, day two of the world famous carnival. Both horses – Ali Vital and Awesome Goal – look nicely placed in the 1700m Best Western Tudor Motor Inn SV 3YO Maiden Plate and are expected to run boldly. Running nicely when third at their first runs this time in, the pair have progressed well although Awesome Goal is a bit more forward maturity wise than Ali Vital. “He is the stronger horse at this stage but there is not much between them,” said Michael Moroney. “Ali Vital ran a good race first up and he has always shown promise as a stayer,” he said, adding that he hopes for a bit of overnight rain. 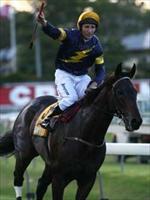 “Awesome Goal has strong wet track form and most of the Yamanin Vital (sire of Ali Vital) stock relish it,” he said. Also stepping up to 1700m second up is the imported mare Poplin who takes her place in the third race, the Warrnambool Hyundai Class 1 Handicap. “We are hoping for some rain for her too,” Moroney said, adding that the lightly raced daughter of Medicean has been pleasing the stable. On Thursday we saddle up Muirfield in one of the feature events of the carnival, the $200,000 Listed Warrnambool Cup – a race we won six years ago with subsequent dual Group One winner Sarrera. “We have been really happy with him and we have been aiming him at this race,” Moroney enthused, looking forward to seeing the Don Eduardo five-year-old step up in distance. Race ten on Thursday brings the Warrnambool racing feast to a close and we have three runners in that race, the Fresha Fruit Juices Handicap over 1700m – Picture Editor, Spectral Black and That’s The Way. Spectral Black meanwhile is considered by the stable “a promising young horse” and his latest victory at Kyneton was a strong one. “He has a bit of a tricky gate (14) but by that stage the track may be chopping up a bit and it might be better to be out there,” Moroney said. A recent scratching due to unsuitably firm going, That’s The Way has not raced for 20 days and is expected to improve upon whatever he shows – “he probably needs another run,” said Moroney of the son of Pentire.